Make a donation on #GivingTuesday and your gift will be doubled! All gifts will be matched 1:1 on #GivingTuesday by buildOn supporters Britta and Denis Nayden! Britta and Denis are two long-time members of the buildOn Movement who have given selflessly to help break the cycle of poverty, illiteracy and low expectations. This year, they want as many people as possible to support buildOn, so they’re matching your donation on #GivingTuesday until we reach $10,000. Even better, our giving partner Classy is waiving all online gift processing fees, which means 200% of your gift goes directly to buildOn. 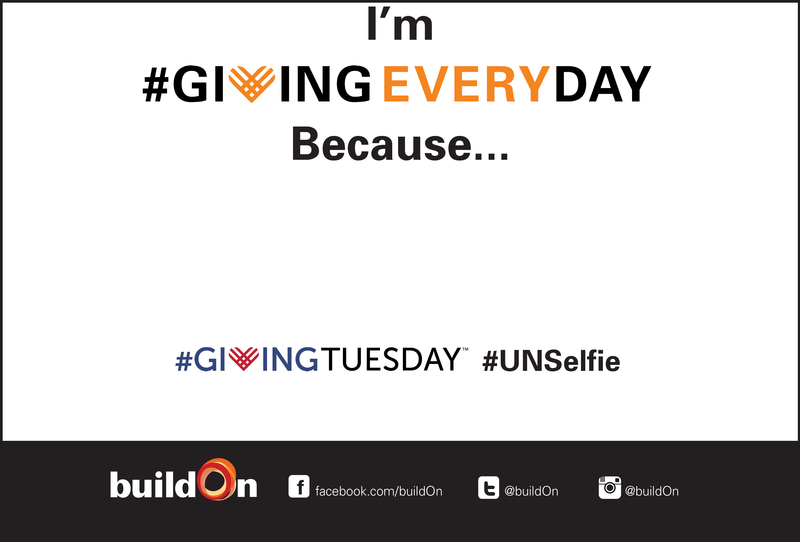 Share a buildOn #GivingEveryDay #UNSelfie: Show the the world you’re a member of the buildOn Movement with an #UNSelfie! Just download and print one of the signs below, take a selfie holding your sign, and post to Instagram, Twitter or Facebook. Be sure to tag buildOn and use hashtags #GivingTuesday and #GivingEveryDay.